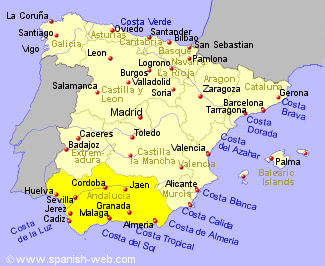 Andalucia is a huge region of Spain representing one sixth of the country and forming the whole of the south from Huelva to Almeria. With five of the provinces being on the edge of the Mediterranean and Atlantic, fish dishes are a speciality. A variety of fish is baked in salt such as sea bass, mullet and bream. Being cooked in this way retains all the flavour and only absorbs the salt it needs. Fish soups are very popular also shellfish such as prawns, crab, clams, and mussels. It is also known for its chilled soups such as Gazpacho, made with onions, tomatoes, peppers and cumin, also Ajo Blanco made with local grapes and garlic. Serrano Ham which is cured in the cold air of the Sierras, hence its name, is eaten with bread and used to flavour many local dishes. Cocidos, stew, is when everything is cooked in a pot with as many as 6 different kinds of vegetables such as chard, cabbage, broad beans, peas, and green beans, to name a few, depending on the time of the year, apart from the traditional meat and pork. A variety of game is used in recipes including venison, partridge, rabbit and wild boar also lamb and chicken. In Jerez de la Frontera where sherry is made a local dish called Rinones al Jerez, kidneys cooked in a sherry sauce, is regularly served. The Moorish influence which is strong all over Andalucia is included here also with the desserts. Yemas, candied eggs, Tocio de Cielo, a jelly of syrup and egg yolks and little cakes known as Alfajores made with almonds.